Sometimes you think you've gotten over a person, but when you see him smile you suddenly realize you're just pretending you're over him to ease the pain of knowing that he will never be yours. 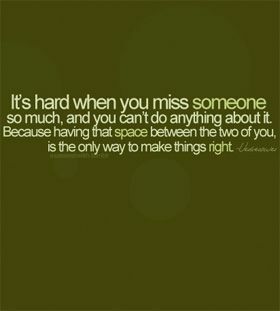 Omg That is soo true for meh >. Missing someone is one of the hardest thing in life specially when that someone is far from you ..
You can spend your life holding on, or you can show that idiot who broke you're heart what he's missing. You never quite realize how much you love and need him until the very moment you realize he's slipping away. 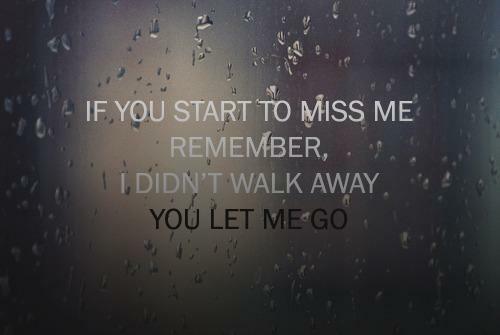 If you start to miss me remember, I didn't walk away, you let me go.